Ahead of the arrival of the 182 registration plate on July 2, Ford says that it has a range of great offers as part of the company’s ‘Clean Up for 182’ campaign. Deals on offer include promised reductions of up to €6,000 on some of Ireland’s best-selling cars, plus the peace of mind of a seven year warranty. Ciarán McMahon, Managing Director of Ford Ireland stated, ‘this summer, we are inviting anyone in the market for a new car to opt for one of our new models which have engines that are all Euro 6 compliant, meaning they all meet the strictest European emissions regulations. In this way, we are offering motorists the opportunity to get out of older, less fuel efficient cars and ‘Clean Up for 182’. Ford Ireland also says that the ‘Clean Up for 182’ campaign includes reductions on hi-spec versions of several of Ford’s most popular models including, the Kuga ST-Line with a reduction of up to €6,000, the new EcoSport with a reduction of up to €4,250, the Focus Titanium with a reduction of up to €5,250, the Focus ST-Line with a reduction of up to €4,700, the Fiesta with a reduction of up to €1,750, the Grand C-MAX Titanium (seven seater ) with a reduction of up to €5,150, the Mondeo ST-Line with a reduction of up to €5,950, the S-MAX ST-Line with a reduction of up to €4,150 and the Galaxy Titanium with a reduction of up to €4,350. 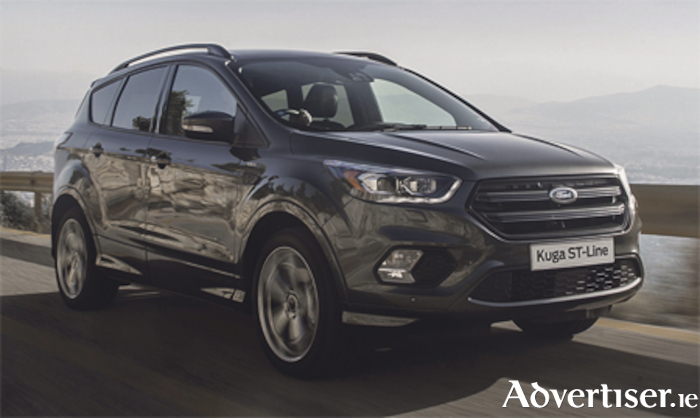 It points out that the stylish and sporty ST-Line version of the popular Ford Kuga is a great example of the value to be had in the ‘Clean Up for 182’ offers. The versatile Kuga ST-Line is available with SYNC 3, the latest version of Ford’s cutting-edge interactive entertainment and communications technology (incorporating satellite navigation ), hands-free tailgate, rear view camera, and panoramic roof, priced from €33,050 at participating dealers, and as always with offers, terms and conditions apply. ‘The ‘Clean Up for 182 deal’ on Kuga ST-Line makes that model a strong contender for anyone looking for an attractive SUV with lots of specification and cutting-edge technologies and all at a great value price’, concluded McMahon.